The debate on the over-commercialization of Christmas seems to come each and every year. And yet, Christmas music is such an integral part of the season. It sets the mood. After all, what is Christmas without Bing Crosby, Johnny Mathis, and Nat King Cole. Those guys (and many others) recorded iconic songs that are synomous with the season. But what about Halloween? Where are the iconic Halloween songs? Perhaps we feel Christmas, whereas we experience Halloween. Halloween has a more visual component to it. This seems to be true with all of the scary movies on TV and in movie theaters during that time of the year. But that doesn’t stop the members of the Asheville based-band, The Mad Tea (formerly Mad Tea Party). 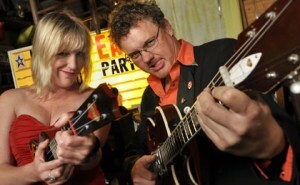 The Mad Tea consists of Ami Worthen (ukulele, vocals) and Jason Kreckel (guitar, drums, vocals). For over ten years, this garage-pop duo has been rocking’ out audiences all over and is a frequent opener for another North Carolina-based band, Southern Culture on the Skids. Now, first things first. This band is all about the music – not politics. In fact, that is why they have had to change their name to The Mad Tea. According to their website, they are trying to “get away from the darn political associations and get back to the business of rock ‘n roll”. Unfortunately, the Google goes with what’s popular – and in the last few years, the conservative Tea Party movement has continued to trend. Even though they share a similar name, they are completely different. Especially the way the band treats their music. Their mission is to rock out and have fun. You won’t find political commentary on their website. 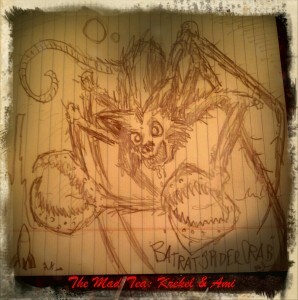 You will find, however, their latest Halloween/spooky musical contribution, “Batratspidercrab”. And it’s yours free to download. This marks the third year in a row that Ami Worthen and Jason Kreckel have put together a Halloween-inspired project. 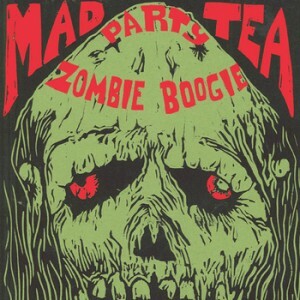 In 2009, they released Zombie Boogie – a four-song EP featuring two originals and two obscure covers. It was so well-received, they did it again the next year releasing another four songs entitled Rock n’ Roll Ghoul. They are back at it again, yet a bit scaled back releasing just one song this year. However, it for Halloween lovers everywhere to download for free. At first glance you think it’s a coincidence. However, now in their third year, I can safely say this is a trend. I think it’s safe to say that The Mad Tea enjoy the Halloween holiday. Between both Worthen and Kreckel, they both share a love and passion for all things Halloween. It’s fits within their mission as a band – to have fun. Halloween is a time to loosen up the collar and let those creative juices flow. It’s a time to fire up those imaginations and for one night only become larger than life. That’s what a show with The Mad Tea is all about. And at the end of the day, if they can provide some music to the Halloween soundtrack of your life, then they will have down their jobs. To learn more about The Mad Tea, and to download their latest Halloween-inspired single, visit them online at www.themadteaparty.com.